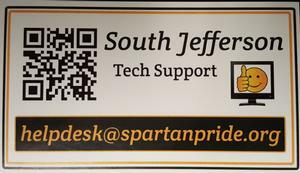 The South Jefferson Information Technology Department supports the digital needs of the district and assists in providing a safe, positive learning environment that engages, nurtures, and challenges each student as they grow academically, socially and emotionally. Please visit our Parent Portal page to learn more about the digital products and services used by our district including instructions for requesting access. New teachers and new staff find this help guide a valuable resource to learn more about the technology used in our district.